Vinegar is touted as one of the most useful things to have at home because of its many purposes, aside from being used in food preparation. Most of the alternative uses fall under the category of cleaning, but vinegar can even be used for setting dyes in fabrics, killing weeds, and keeping ants away. White vinegar makes for a great cleaning agent because it is clear, but there are many other vinegars out there that can leave stains behind. Balsamic vinegar, red wine vinegar, wine vinegar, rice vinegar, and apple cider vinegar are all examples of vinegars with dyes, sugars, and other stain-inducing ingredients. If you cook, bake, or pickle with these vinegars, read on to learn how to remove their stains. It’s best to hold the fabric so that you can clean it freely, for example: if the stain is on the curtains, unhook the curtains so that you can adjust and scrub at any angle. Household ammonia is ideal for attacking vinegar stains: using a sponge, dab the ammonia onto the fabric. Continue dabbing until the stain has lightened in colour—this may take five to 15 minutes of continuous treatment. When you have finished, launder the fabric as you usually would, following the instructions on the label. 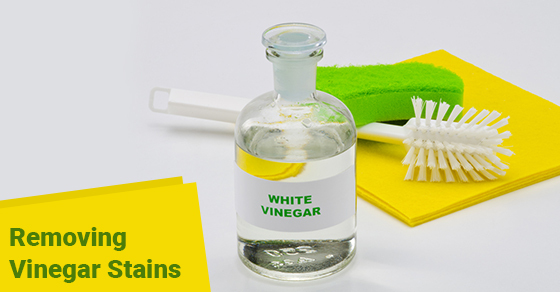 Mix white vinegar with rubbing alcohol at a ratio of 1 to 10, and using a clean cloth, blot the area over and over. You may need to focus on the outline of the stain, as outlines draw attention to stains, but since there’s more pigment there, it will require more sponging to remove. If you feel like the upholstery has absorbed too much of the cleaning solution, use a clean, dry cloth to absorb the dirtied liquid. When you’re satisfied with the results, dilute the solution with cold water and cover with a cloth to dry. Small stains can effectively be cleaned using spot treatment, but larger stains will require heavy duty cleaning, such as steam cleaners, which cleaning professionals use for deep cleaning carpets and other surfaces.